Geneva - A detailed report on the risks facing Libyan women married to foreign nationals was issued today by the Euro-Mediterranean Human Rights Monitor. The report illustrates the Libyan legislation’s arbitrary restrictions placed on this type of marriage, depriving husbands and children of the right to the Libyan nationality. The discriminatory nature of the Libyan legislation is also highlighted in the report as it grants the right to nationality to the family of Libyan men (but not women) married to foreign nationals. This discriminative law has further fueled community bullying and oppression of women married to foreigners as well as their families in Libya. Titled “Libyan Women Married to Foreign Nationals: Oppression and Stateless Children,” the report reviews the most problematic challenges facing Libyan women married to foreign nationals. It also details the legal barriers with recommendations to state officials on how to counter these barriers. Testimonies of a number of Libyan women subjected to discrimination by their communities because of marriage to foreign nationals are also recorded in the report. The Libyan law stipulates that Libyan women married to non-Libyans must obtain the approval of a committee of the Libyan Ministry of Social Affairs if the husband is Arab, and must obtain a security approval from the External Security Service if the husband is not Arab. Libyan officials cite national security as well as demographic structure concerns when justifying the act. 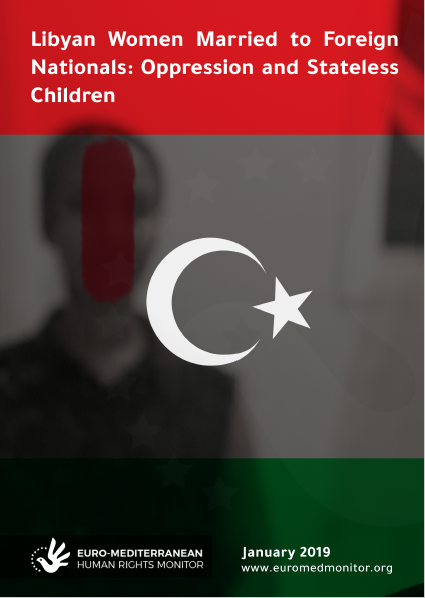 Unlike children of Libyan men married to non-Libyans, children of Libyan women are forced into complicated procedures that often lead to statelessness, unless they acquire the nationality of their father. They also do not enjoy free education, health care, the right to nationality, or any civil or political rights. The report concludes that the legal treatment of Libyan women in this regard violates international obligations under the Convention on the Rights of the Child, the Convention on the Elimination of All Forms of Discrimination against Women and the International Covenant on Civil and Political Rights. Recounting her story to Euro-Med’s team, A. S., 29, and a Libyan woman from the town of Zawiya, west of the Libyan capital of Tripoli, said she had married Bassem, a 27-year-old Syrian national who has been living in Libya for over 11 years. He worked as an engineer in a private company. She explained that they moved to the area of Janzour, west of Tripoli, and then she gave birth to two children, enjoying at first a stable life despite the difficulty of living away from parents and relatives. However, the beginning of 2017 brought unexpected results. She pointed out that they could not complain to the police for fear of being threatened again, especially since one of their brothers was a central security officer in the capital and, most importantly, that their marriage contract was not documented in the civil registry because they did not obtain approval from the Ministry of Social Affairs, which means that nobody in the state recognizes them as a married couple. “The Libyan authorities' way of dealing with Libyan women married to foreigners is adding to the society’s stigmatizing view of women married to foreigners,” said Aroub Sobh, Euro-Med’s women's adviser. Libyan women married to foreigners find it very difficult to obtain papers and identity documents, because the official Libyan authorities refuse to deal with any Libyan woman who marries a foreigner, whether in relation to her husband or her children, unless she obtains the permission of the Ministry of Social Affairs, added Sobh. As noted in the text of the Libyan law, marriage to foreigners does not mean Libyans do not need to obtain the approval of the Ministry of Social Affairs Committee. However, the difference lies in the implications of the distinction between children born to male or female Libyans. Children born to a male Libyan enjoy full nationality and citizenship rights as if they were born to Libyan parents. They enjoy civil, political, economic and social rights. However, children born to a Libyan mother married to a foreigner do not enjoy these rights. M. Kh., 33, is a Libyan woman married to an Egyptian national for several years. She said she regrets her marriage whenever she thinks of her fate and the fate of her son and husband, who was kidnapped by armed groups. M. Kh. explained that it is difficult for her to obtain documents from the civil registry of the Libyan state, which refuses to deal with any Libyan woman married to a foreign national or with her children, especially if the marriage was concluded without the approval of the Ministry of Social Affairs. “Women and men must be equal in their rights to acquire and grant citizenship to their children,” said Sarah Pritchett, Euro-Med’s spokeswoman. Articles 2 (a) and 9 of the Convention on the Elimination of All Forms of Discrimination against Women (CEDAW) affirm the need for equality between men and women. They also stress the need for incorporating this principle into their laws, including equality in the right to acquire nationality and to grant citizenship to their children. The Convention obliges States to grant women equal rights in terms of acquisition, retention or change of nationality, which is the same provision contained in The Protocol to the African Charter on Human and Peoples' Rights on the Rights of Women in Africa (or The Maputo Protocol), which Libya has ratified. Everyone shall have a right to nationality. This was the essence of the text of Article 15 of the Universal Declaration of Human Rights (1948). Article 24/3 of the International Covenant on Civil and Political Rights, which Libya had ratified without reservations in 1970, stipulates that: “every child has the right to acquire a nationality” and Article 3 of the same Covenant sets out the duty of States to ensure the equal right of men and women to enjoy all civil and political rights enshrined in the Covenant. The Euro-Mediterranean Human Rights Monitor calls on the Libyan authorities to amend the Marriage Law between non-Libyans and Libyans No. 15 of 1984 in order to guarantee the rights of Libyan women and their ability to choose their partner in accordance with the international conventions ratified by Libya. Euro-Med Monitor also hopes that legislators in Libya will exert more efforts to ensure the rights of women in Libya and their equality to men, especially with regard to their right to grant their nationality to their children.